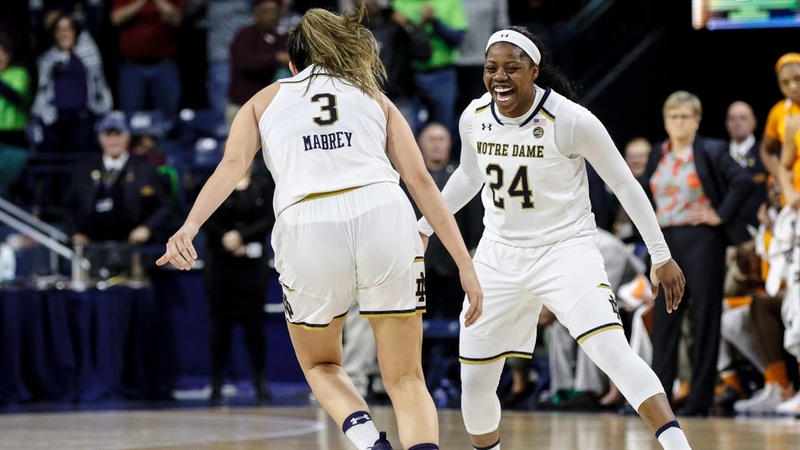 ESPN is already hyping this Sunday’s 1 vs. 2 matchup with UConn at Purcell Pavilion by recounting the most memorable plays in the series between the Irish and the Huskies (Arike Ogunbowale’s game-winner in the final seconds of the national semi-finals came out on top). However, before the Irish tangle again with UConn, they play another ranked team in Iowa Thursday evening at Purcell. Three of ND’s first six opponents are ranked: #9 Oregon State, #16 DePaul and #24 Drake. Iowa is currently #14 in the latest AP rankings. The Hawkeyes won their first four games of the season before losing to Florida State (71-67) in the finals of the Junkajoo Jam tourney this past weekend. Iowa averages 90.2 points per game and are led by Megan Gustafson, a 6’3” senior forward, who is averaging 23.2 points and 12.6 rebounds per game. Florida State limited her touches Saturday night — she only scored 16 points, but was 8 for 8 from the field and didn’t attempt a free throw. In other games, Gustafson has scored 23, 29, 20, and 28 points and grabbed 17, 12, 10 and 16 rebounds. She is incredibly efficient on offense — she’s made 77% of her field goal attempts and connected on 77% from the line over the first five games. Based on a simplified offensive efficiency formula developed by Kansas City sportswriter and statistician Martin Manley (points + rebounds + assists + steals + blocks - missed field goals - missed free throws - turnovers), her EFF (efficiency rating) through five games is 39.6. Jackie Young leads the Irish through six games with an EFF of 24.0, followed by Jessica Shepard at 22.4, Arike Ogunbowale at 19.7 and Brianna Turner at 18.5. Note: the NBA is using a more complicated formula developed by John Hollinger — the player efficiency rating (PER). I’m choosing to use the EFF approach because I have all the data needed in a spreadsheet from the full season last year and through six games this season. While it doesn’t factor in other measures like minutes played, pace of game and both offensive and defensive rebounds (among others), the simplified EFF is a way to compare relative performance among players and teams. Gustafson is complemented by four other starters (two other seniors, a junior and redshirt sophomore) who all average in double figures. Makenzie Meyer, a 5’9” junior guard, averages 15.0 points per game, Hannah Stewart, a 6’2” senior forward, averages 13.4 points and 7.0 rebounds, Tania Davis, a 5’3” senior guard, averages 12.0 points, and Alexis Sevillian, a 5’5” redshirt sophomore guard, averages 10.8. The Hawkeyes average 8 three-point makes a game with Meyer leading the team making 15 of 35 (43%) — an average of 3 per game. The team averages 25 assists per game with each starter averaging between 2.6 (Gustafson) and 5.4 (Meyer) per game. ND is averaging 16.8 assists per game led by Jackie Young’s 5.2 per game. Iowa’s current 90.2 per game scoring average was plumped up by 104 and 106 point nights against Western Kentucky and North Carolina Central. Still their team EFF is 122. ND’s EFF is currently 108. As noted above, while Ogunbowale leads the Irish in scoring at 24.5, her EFF of 19.7 is third on the team. From game to game, a player’s EFF rating can swing significantly. In the last game vs. Oregon State, Arike’s EFF was 11, while Jackie led the team that night at 32 followed by Brianna Turner’s 27. Arike was named the most outstanding player at the Vancouver Showcase, while Jackie Young was selected by ESPNw as the player of the week. For the three games in Vancouver, Jackie averaged 20.7 points, 6 rebounds, 6.7 assists and 1 turnover for an average EFF of 26.3. Arike averaged 24 points, 6.3 rebounds, 2.7 assists and 2 turnovers for an EFF of 18.7. At the Final Four, Jackie led the team and scoring and EFF against UConn — 32 points and 34 EFF. Arike scored 27 including the game winner. Her EFF was 19. Jessica scored 15 with an EFF of 19 and Marina only managed 7 points and an EFF of just 4. After a horrid first half, Arike scored 18 points including the memorable game-winning three vs. Mississippi State. Her EFF was 18. Jess led the way with 19 points and an EFF of 24, while both Jackie and Marina struggled offensively. Jackie only scored 6 points, her EFF was 5. Marina’s EFF was 7. She scored just 10 points — but made a crucial 3 pointer (her only successful three-point attempt of the game) with 1:35 remaining to pull the Irish back to within two. Jackie only connected on two field goals all game, but the second one tied the score with 45 seconds remaining to set up Arike’s last shot heroics. After the final game, ND’s team EFF for the season was 105.8 and Mississippi States’s was 97.0. The final was a grind — the Irish team EFF was just 64 while MSU’s was 56. Recruiting notes: Haley Jones, considered the top player in the 2019 recruiting class, finally announced her college choice today. She’s moving a few miles up highway 101 from San Jose to Stanford. This boosts the Stanford recruiting class to #2 in the nation behind South Carolina’s class of five signees. Notre Dame signed a small two-person class (Samantha Brunelle and Anaya Peoples). The Irish come in 12th in the recruiting rankings. UConn is not ranked among the top 20 with just a one person class. The Huskies missed out on both Jones (Stanford) and Aliyah Boston (South Carolina). ND had been a finalist for both as well.